Affordable and sturdy: The robust all-round series is, like all glasses by Stölzle Lausitz, dishwasher-safe. Ideal for day to day use. Height: 195.5 mm / 7¾"
Diameter: 79 mm / 3"
The glasses from the Weinland series are suitable for everyday use. At the same time, they shine with their timeless elegance and are robust and highly break resistant. This longevity is one of the reasons why the glasses have been much loved by restaurant owners and hoteliers alike for decades. The white wine goblet by Stölzle is elegantly curved. Despite all this elegance and simplicity, the glass is extremely stable. Made from lead free crystal this machine made glass, with its unbeatable value for money, is the perfect choice as a present for the next party with friends or relatives, be it a wedding, a birthday or as a first set in a new home. 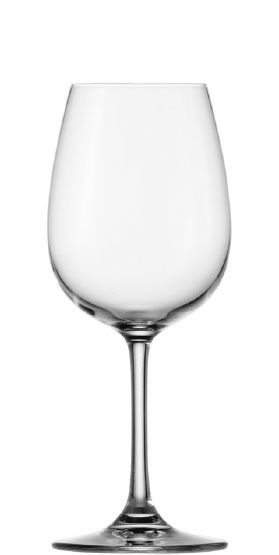 This white wine glass is suitable for fresh, fruity white wines. A young Riesling, a Silvaner, Pinot Blanc and Pinot Gris, but also a Muscat and a Sauvignon Blanc can fully show their strengths when it comes to aroma and taste.